It’s only a matter of time before Ronan Curtis earns a full Republic of Ireland cap. That is the verdict of Chris McNulty, the Pompey forward’s former coach at Kildrum Tigers. 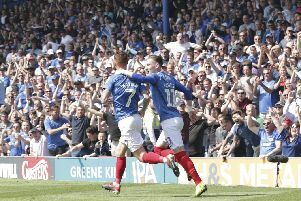 The 22-year-old has set League One alight following his Fratton Park arrival from Derry City for an undisclosed fee in June. Prior to the trip to Rochdale, Curtis had recorded five goals and five assists for Kenny Jackett’s men this season. He has become the Blues’ talisman in the early push for promotion to the Championship. Such rampant form also earned Curtis a maiden call-up to Martin O’Neill’s Republic of Ireland squad for their friendly against Poland last month. He was elevated from the under-21 squad for the Wroclaw clash, which ended 1-1. Curtis was an unused substitute, although the Eire boss is keeping a close eye on the chirpy attacker’s progress. He could be involved in his country’s squad for their games against Denmark and Wales in Dublin next month. McNulty, who coached Curtis as a junior at Kildrum Tigers, is convinced his former star will earn a senior cap for his nation. And he believes it would be a fitting way to toast the Tigers’ 70th anniversary if it happens next month. McNulty said: ‘To get a call-up to the senior squad is a pointer to where he is going. ‘It’s only a matter of time now before he wears the green jersey at senior level. ‘You’d have to go down to watch him. There’s a lot of us from the club who go and watch Ireland when we can anyway. ‘But if the chance came that one of our guys was going to play then it would be a moment you’d have to be there for. ‘It’s a moment that is going to come. The club celebrates its 70th anniversary at the end of the year. ‘And what a better way to bring that landmark up than seeing one of our former players become a senior international. ‘There’s a young girl who came through our system, Tyler Cullen, who is a Republic of Ireland women’s international. ‘But Ronan is the first player at men’s level to earn a senior call-up to the Republic of Ireland squad. Curtis has also proved an inspiration for the current crop of upcoming talent at Kildrum. He has shown the budding young players at the club their dreams of becoming a professional footballer are achievable. ‘Even watching his progress at Derry City you were very proud to see him,’ added McNulty. ‘As a club, we always bring up memories of Ronan and now he’s being recognised at a top level. ‘We’ve seen guys go over to England before and they have only been there for six months or so and come back. ‘But Ronan has been there a matter of months and caught fire. From a club level, you have got to be proud.